The enquiry of the Justice Somayajulu Commission, which was appointed to enquire into stampede incident at Pushkara Ghat during Godavari Pushkaralu- 2015, has reached the final stage. The commission has asked the government counsel for clarity on the evidences it has produced. 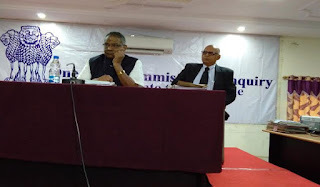 The government counsel appearing on behalf of state government has made it that no government agency or authority is responsible for the freak incident on 14 July, 2015.Meanwhile, the deponent, Muppalla Subbarao has presented his final arguments. Muppalla pointed out there was no CC camera footage record with 72 hours backup with district administration. There was no water facility to pilgrims who were passing through queue lines who wanted to take holy dip. Traffic was not stopped where the crowd was more and vehicles were parked at gate number one and two even when the VVIP was taking dip in the ghat. During the enquiry earlier on Tuesday, the government counsel Prabhakar concluded his arguments from government side orally and also with documentary evidence. Prabhakar gave his reply to the questions asked by Justice Somayajulu and his legal assistant Madduri Siva Subba Rao. The government counsel said the people who wanted to take holy dip on the first day led to stagnation at Pushkara Ghat and two gates were opened from early hours. He pointed out that everyone wanted to take dip at the same muhurtham time which led to heavy congregation and three to four trains came at the same time and stopped at Godavari station, due to which rush suddenly increased. Crowd started breaking barriers and also started going through exit gates also. Gate no.1 was also closed for brief period to control mob. Then the Commission asked who got the power to open and close the gates, how many people were manning the gate to control mob and proximity of dead bodies from the gate and other details from administration as they were not known to the Commission. Prabhakar clarified that the district administration has printed a manual on crowd management in which it was not specific that who has to take decision on closing and opening the gates. He also said that he has no information about how many people were manning the gate at the time of incident.